Disclosure: Thank you to Kohl’s for sponsoring this post. As always, the text and opinions are 100% mine. Thank you for reading! You’re going to get tired of me saying this, but I seriously cannot believe my first born baby is going to kindergarten in less than a month. It feels like yesterday she was placed in my arms for the first time, and now we’re crossing this huge milestone. I’d be lying if I said I wasn’t a little bit nervous or worried about Kennedy’s first day of kindergarten. I know she is a smart and strong little girl, but I hope she’ll make lots of friends, her teacher will like her, and she succeeds. Normal mom concerns, I’m sure. I am not sure about Kennedy, but I’m sure feeling those first day jitters. What do we put in the backpack? Where do we go on the first day of kindergarten? Will she think I’m a loser if I want to kiss and hug her at drop off? Luckily we’re checking off one of those questions today – we’ve got the cutest first day of kindergarten outfit ideas! Kohl’s is always at the top of our list for fashionable and affordable clothes for the whole family. Not to mention, they’re having their big friends and family sale right now! You can use code FAMFRIENDS for 20% off sitewide. They really have the best back to school outfits! 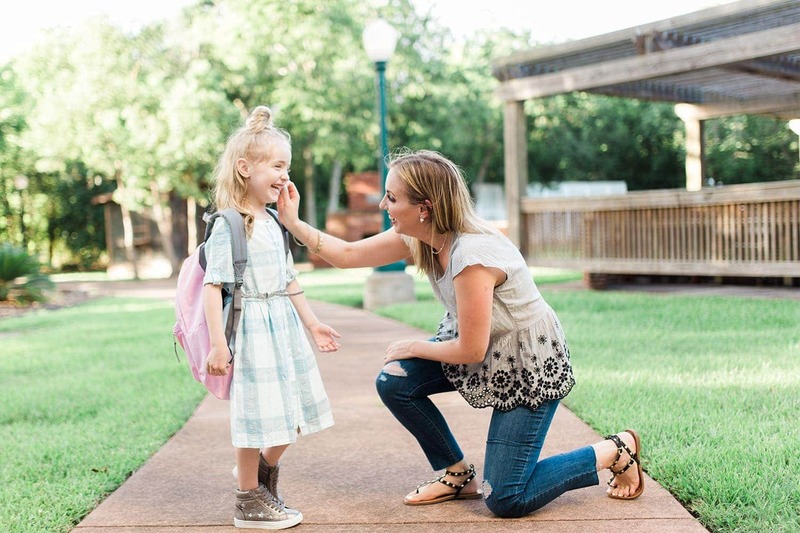 For this post, we put together two back to school outfit options on Kennedy, along with one outfit idea for mom! I just love how trendy and cute this look is for Kennedy. Pairing a simple dress with some glittery high tops is not only a fun fashion statement, but is totally functional. To amp up the whole look, I styled her hair in a half-up top knot. Finally, you can’t forget the adorable and classic pink Jansport backpack! Kennedy definitely brought on the personality while wearing this sassy outfit! You can never go wrong with ruffles and sparkles, am I right? For this look, we paired a fun ruffle top with some sequin embellished jeggings. What a fun, trendy accent to incorporate! The quilted Mary Jane shoes give this look a bit of classic girly feel, while still maintaining comfort. This is such a precious outfit option for the first day of kindergarten, and she’ll be sure to stay comfy all day. Mama doesn’t have an excuse to be a hot mess all the time at drop off, pick up, and school events. I’m all about throwing on a pair of jeans, t-shirt, and sandals, and thought this outfit was a fun elevated spin on that. I will always love a distressed raw hem jean, this blouse is elegant and easy to wear, and the studded sandals look so expensive but won’t break the bank! My heart may not be ready for the first day of kindergarten, but safe to say our closets are. If you need some fabulous back to school outfits, make sure to visit Kohl’s Friends and Family Sale between now and July 30 (dates run 7/27-7/30). Use code FAMFRIENDS for 20% off sitewide! I absolutely adore the outfits you put together! Nothing like a brand new pink backpack to start the year off. I need to check out some of this cuteness!